The central family of this project is the Lynes family, starting, as far as we can learn so far, with Samuel Lynes, born about 1720 in South Carolina. There is a family tradition (among several) that we are of French extraction, arriving with the Huguenot wave in the 1680's, but since 2/3's of the records were lost, a definite link has not been proven. 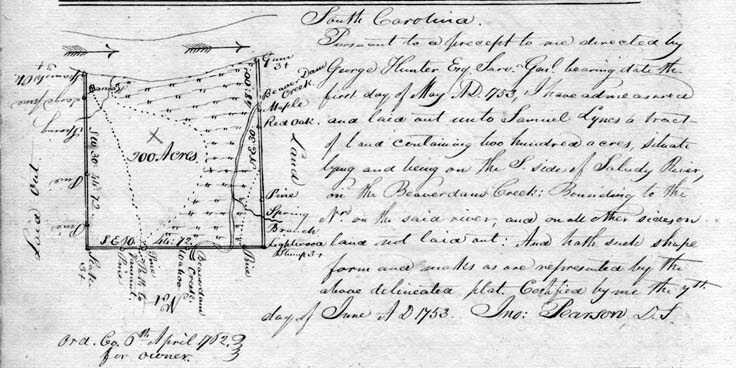 There was a "Thomas Lyne" who received a land grant for 100 acres on the southeast side of the eastern branch of the Cooper River in 1709 (see SC Archives Series S213019, Volume 0039, Page 00066, Item 003) which was the area initially set aside for French Huguenots (hence "French Quarter Creek" in that area) and he may be the father of Samuel whom we seek, but no records have been discovered so far to prove this notion. This Samuel was married to Frances Joyner, but we know nothing about that family at this point, except that the family name exists in the general area. We hope to learn more. 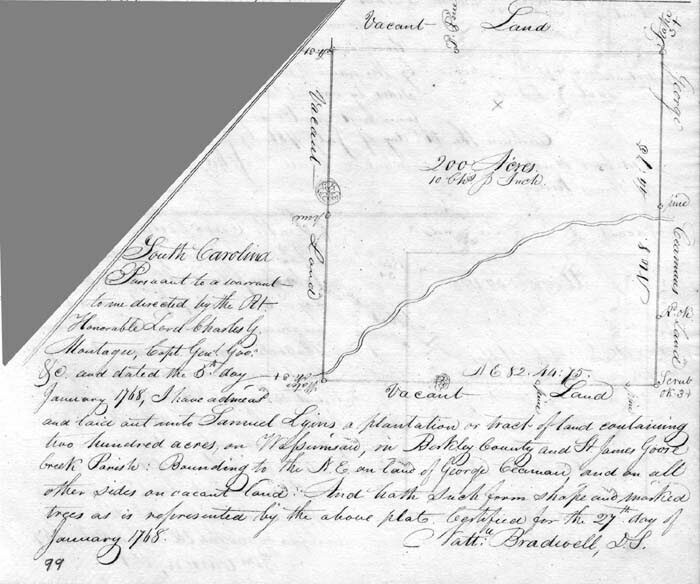 We do know that a young Samuel Lynes, barely 24 years old, received several land grants, first just south of present day Columbia on the Congaree River, then on the Saluda, near Lexington. He was truly a pioneer. By 1768, though, he had returned to the Lowcountry and was established as a planter in the Wassamassaw Swamp area. 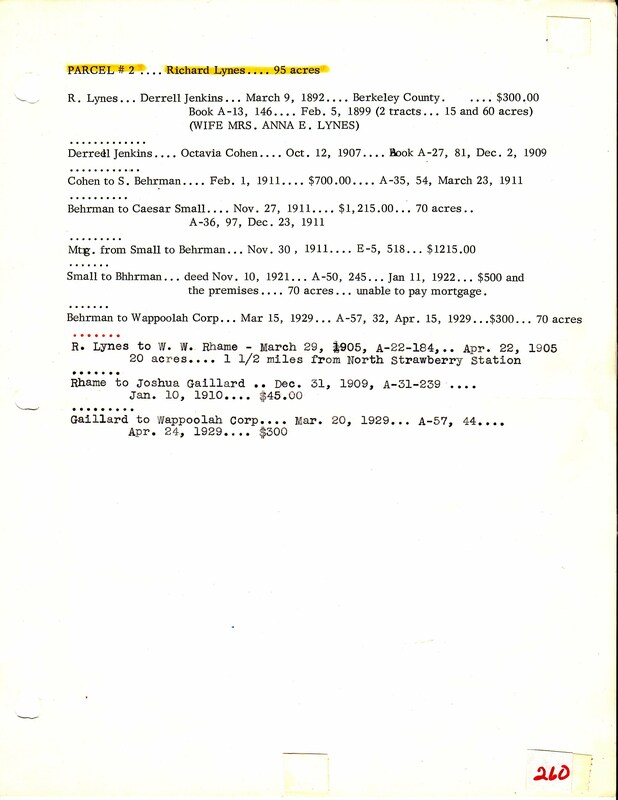 There is a land grant (seen below) of 200 acres on the Wassassamaw to Samuel "Lyins." 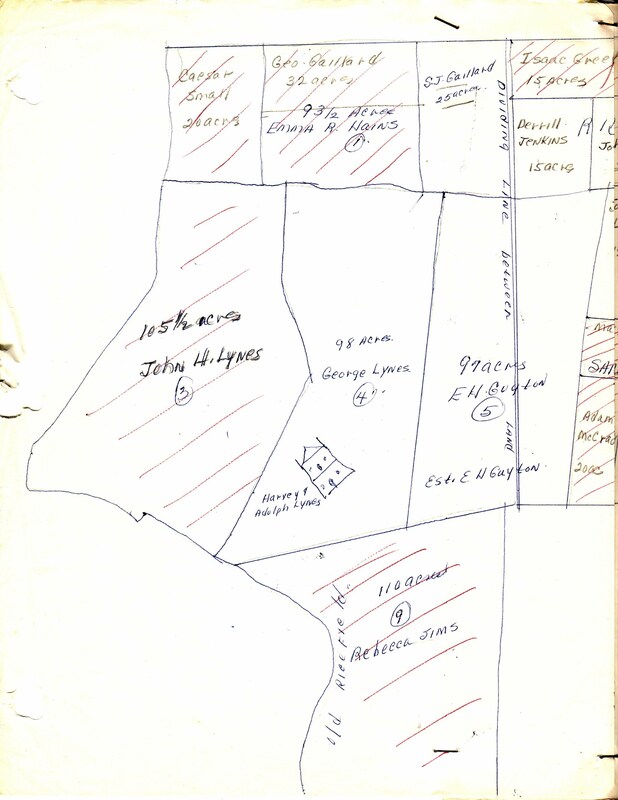 The parcel shows in this map of the Congarees from 1759, although it had apparently been sold in 1750. This was probably a speculative purchase. We have actually located and visited these tracts. 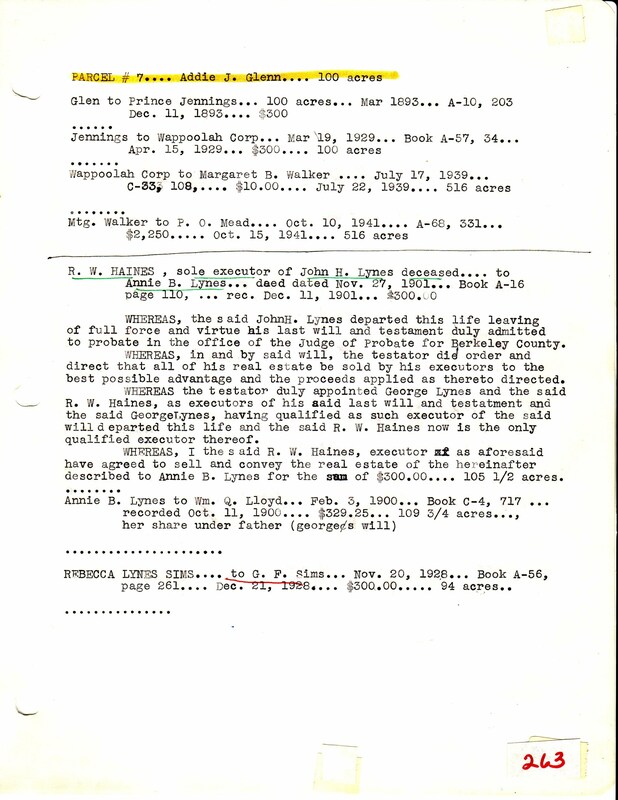 SC Dept of Archives and History: LYINS, SAMUEL, PLAT FOR 200 ACRES IN ST. JAMES GOOSE CREEK PARISH. "South Carolina. Pursuant to a warrant to me directed by the Rt. Honorable Lord Charles G. Montagu, Capt. General .. etc., and dated the 27th day January 1768, I have aduced (?) and laid out unto Samuel Lyins a plantation or tract of land containing two hundred acres on Wassamsaw, in Berkley County and St. James Goose Creek Parish: Bounding to the NE on land of George Ceaman (? ), and on all other sides on vacant land. And hath such form shape and marked trees as is represented by the above plat. Certified for the 27th day of January, 1768. Matt. Bradwell, DS"
Information as to the actual location of this plat is not yet found, and the time between here and the Revolution, and indeed up to Samuel Lynes (born 1776) is not yet found. 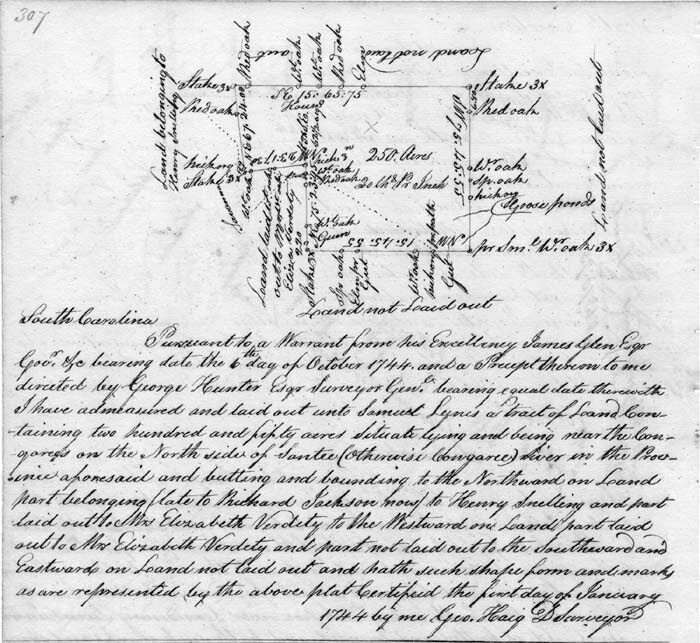 This land was apparently sold at some point, and other lands purchased, including Fox Bank Plantation, which may have been a speculative purchase, since we see it advertised for sale, first in 1768, then purchased by Samuel 1776 in 1819, and then curiously listed for sale in 1824, but we know it stayed in the Lynes' hands until after 1881, when it was broken up into parcels and each descendant of George and Lizzie Lynes were granted their portion. 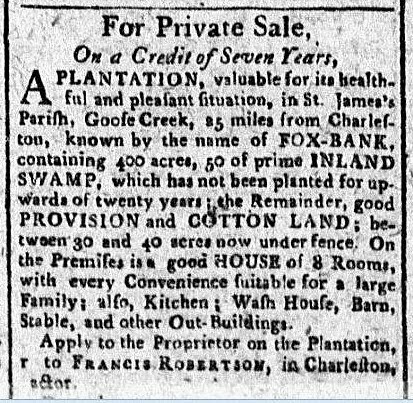 Advertisement for Fox-Bank Plantation, found in the City Gazette of Charleston SC as/14/1797. His Grandson, Samuel Lynes (born 1776) purchased Fox Bank (or Foxbank) Plantation in 1819, and by early 1821 made a final payment for it. 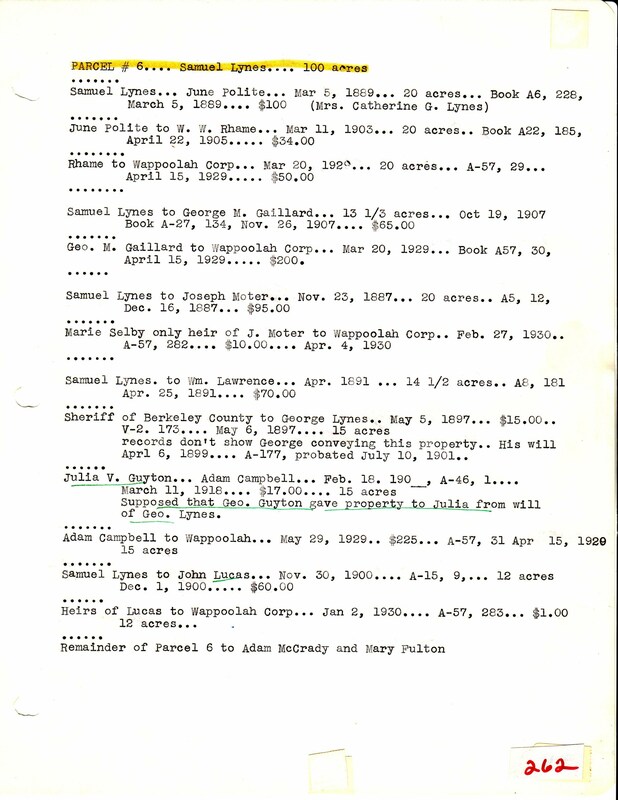 (Samuel Lynes purchased from William McElmoyle, "All that plantation or tract of land called Fox Bank containing 430 acres") -Register of Mesne Conveyance, Charleston County, S.C. BK. B-9 pg. 335-336. This plantation day book is preserved in the archives of the Charleston Museum. 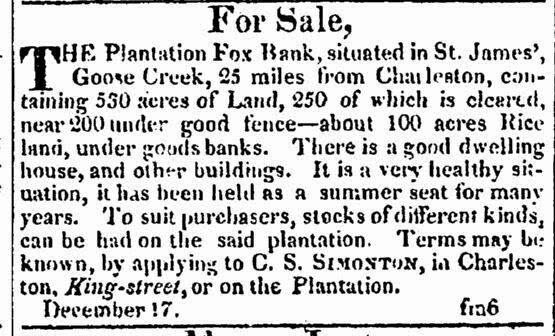 Fox Bank was advertised for sale again on Christmas day, 12/25/1824 but obviously did not sell. In the same era, the Bethlehem Baptist Church was established at the same place as the ruins of the Chapel of Ease to St. James Goose Creek, which is located on Old Hwy 52, in the Strawberry community near Fox Bank, and this was a significant social center for both the Lynes family and all families in the area. 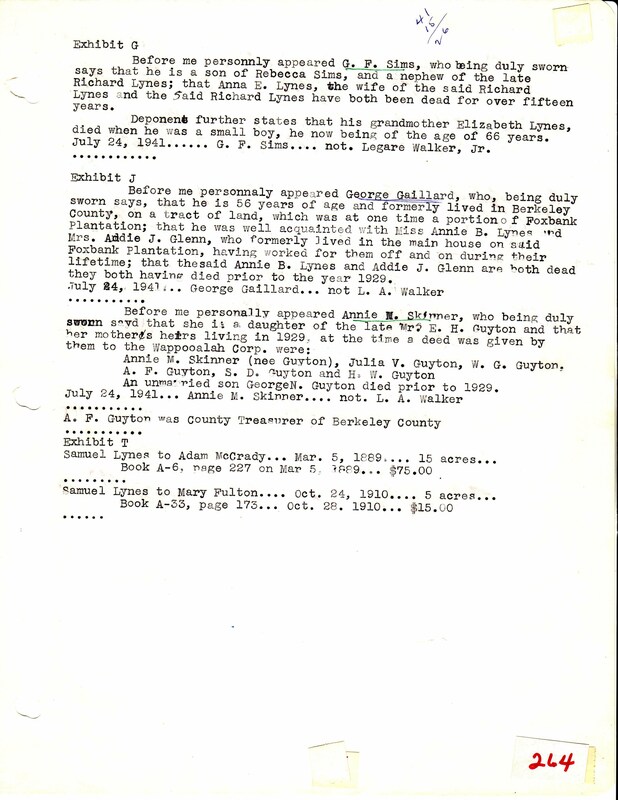 We are in the process of scanning and indexing the records of that church. The Facebook group for the preservation of this historical site may be found by clicking here. We encourage interested parties to join the group and make financial contributions toward its restoration. The committee is now a non-profit organization, incorporated in South Carolina, as the "St. James Goose Creek Chapel of Ease Historical Site." As of December 2012 we purchased the 22 acres site that contains the historical ruins of this place. See our website at Chapel of Ease.org. And Facebook page Friends of the Chapel of Ease. As of November 20, 2017 we purchased the .6 acre site that contains the graves and original site of the Bethlehem Baptist Church. The church building, of course, was moved to Groomsville and called "Goose Creek Baptist Church" then finally "Groomsville Baptist Church." The family foundation also owns that site as well. Willie H. Walling (g-niece [actually nephew]) age 7 months. Frances Dangerfield (listed as "friend" though probably a cousin) Female and age 14. R. S. (Rebecca Signos Lynes Simms) his wife, white female, born Oct 1847, age 52, married 34 years, mother of 14 children, 10 living. George F. (George Fletcher), son, Oct 1878, age 21, single. Samuel Jr., son, born Nov 1897, age 2. We may ask "how did the plantation fall out of the Lynes family?" Well, let's compare: the "laws of inheritance" in England held that only the eldest son inherited, and he inherited the entire landholding. The daughters hoped and tried to find a suitable situation (think of the drama in Jane Austen stories, such as "Pride and Prejudice" or "Sense and Sensibility") and the remaining sons had to make a life in a different way, by going into a profession, like education, medicine, the clergy, the military, etc. Situations were a bit different in Victorian England than they were here, and the comparison is notable. 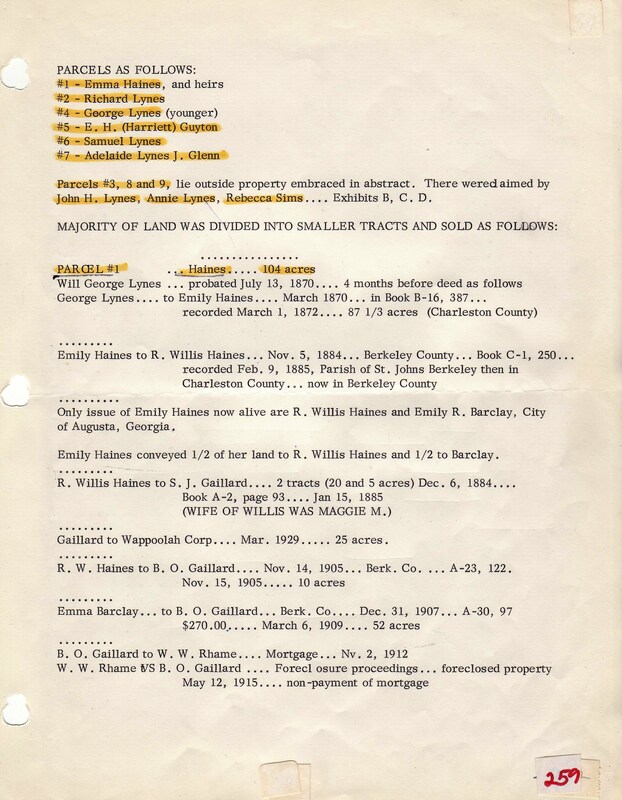 Large landholdings were by design kept intact; while in the United States a decedent could, in his will, divide his holdings up amongst as many people or decendants as he desired, which over a few generations can completely break apart a large estate. That is what happened here. 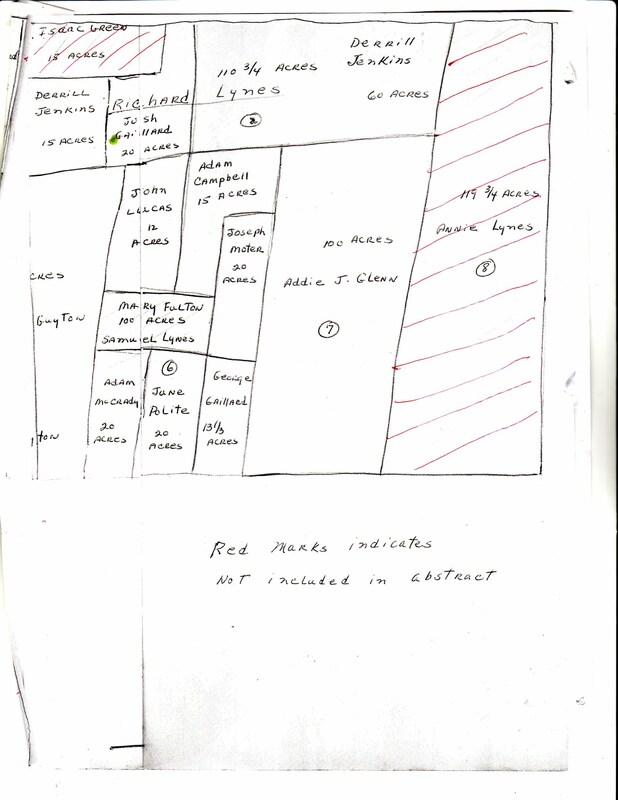 Each one of the descendants eventually sold their parcel for whatever reason, and it should not be held against them, for their holdings were not considered necessarily "ancestral lands" at the time and the owners apparently had no more need nor desire to keep the property than many of us would when we have a change in our lives and move to a new area. We do not usually keep the old house where we lived. Mostly we have to sell to satisfy a mortgage and purchase a new place, and they were no different. 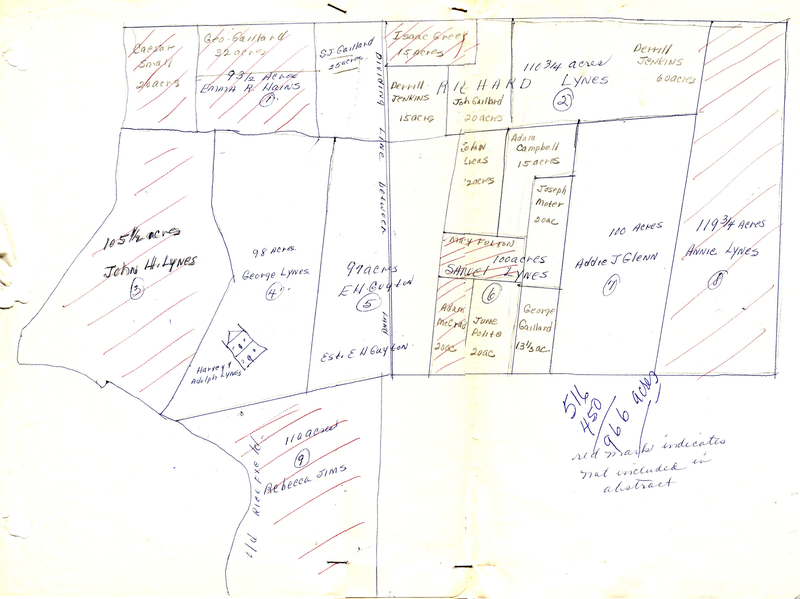 Plus, most of the descendants had holdings or homes in other places, and several parcels were sold to the people or families who were perhaps former slaves but now were sharecroppers, and who had lived on their own parcel for many years. It was only fair to sell them their homes with a few acres for subsistence. So here's what happened: George Lynes died April 23, 1870. The plantation continued to operate under the sharecropper system more or less, and was the home of his wife, Elizabeth "Lizzie" Whitfield Lynes until her death on March 26, 1880. It was after her death that the children of George and Lizzie, all adults, living in other places for the most part and raising children of their own, chose to divide by oral partition, the property left to them in the will of George Lynes. 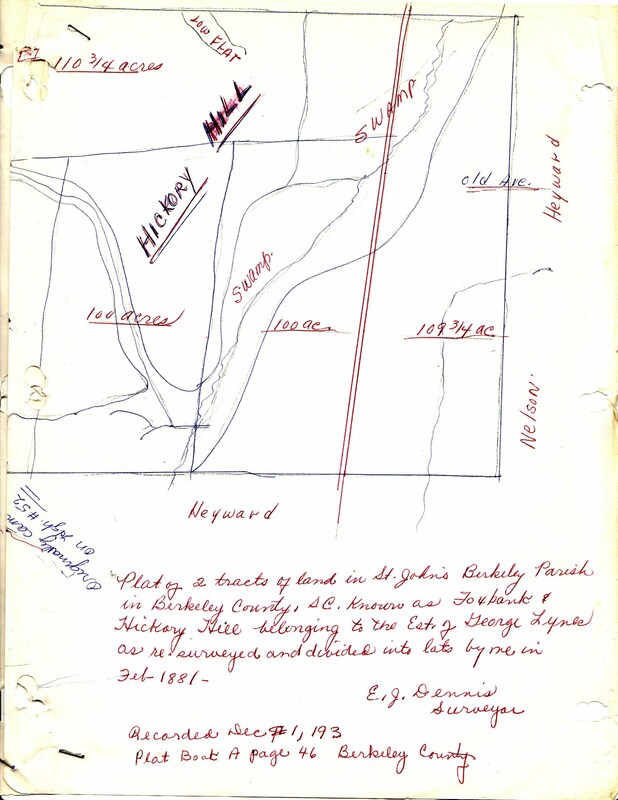 This finally was done in 1893, except for some parcels that had already transferred, namely a tract deeded to Addie J. Glenn in 1881 and perhaps a few others. In short, the plantation was eventually divided up amongst the many heirs. 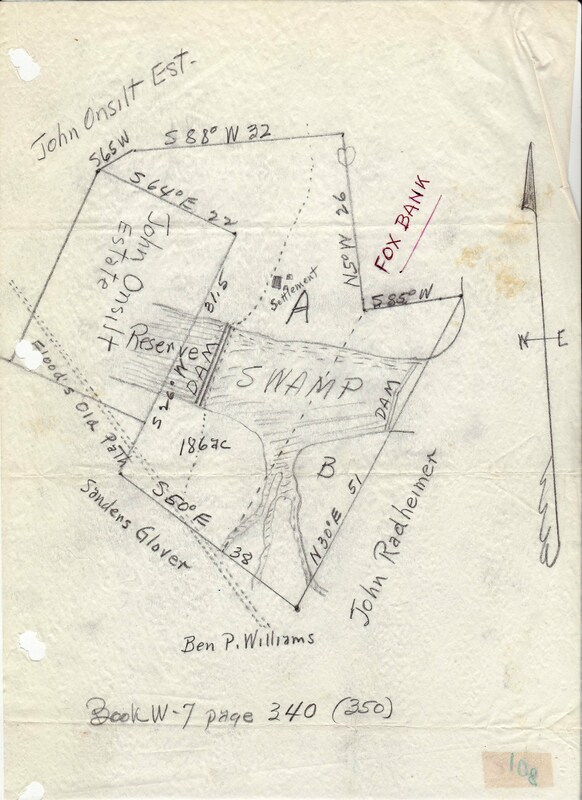 We tend to think in terms of "Fox Bank went to this one person, who sold it..." but actually it was eventually divided into no less than 22 parcels, ranging in size from 15 to 110 acres. The parcel that included the main house was on a piece of 98 acres. So when we hear that "so and so inherited Fox Bank" and it's a different name each time depending on who you talk to, it is true. Many people "ended up" with Fox Bank, or pieces of it. 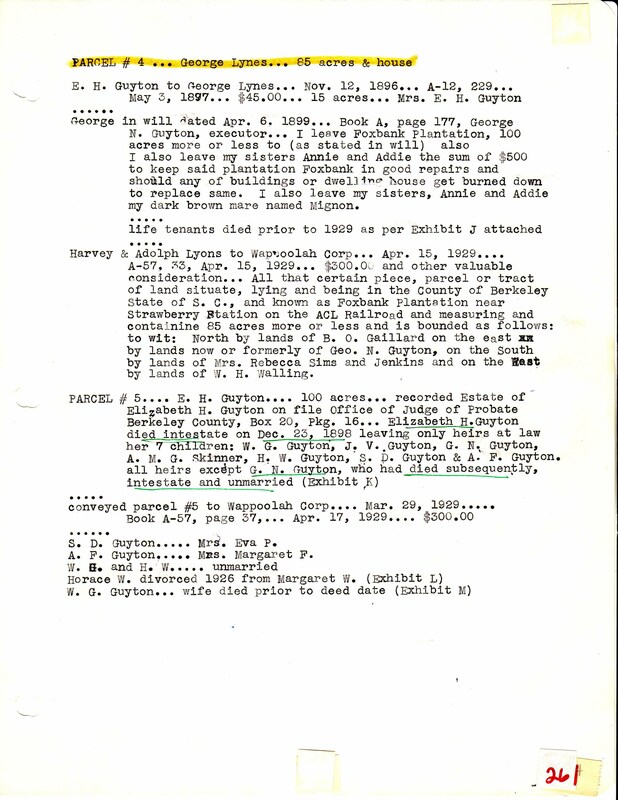 A timber company, "Wapoola Corporation" appeared to make a concerted effort in the late 1920's to purchase each portion, and by 1939 most of Foxbank had been reassembled under their ownership, and was composed of, at least, a tract of 516 acres that included parts of Foxbank and Hickory Hill. 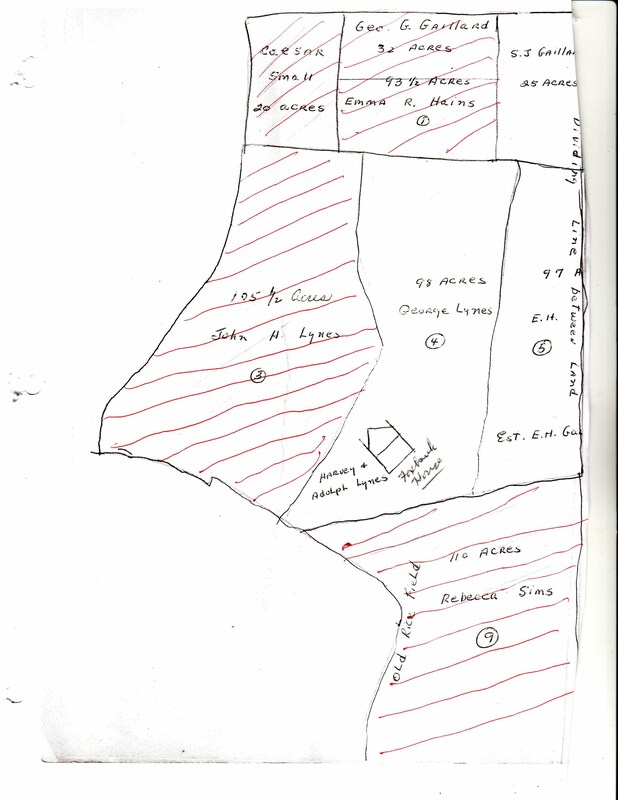 Add an additional 450 acres not owned by Wapoola, and it was a tract of 966 acres. Our understanding so far is that this is what Mr. Ben Scott Whaley purchased. The Whaley heirs then sold in modern times to a developer who subdivided it into a housing and multi-use development. That development is named "Foxbank Plantation" and for clarity, we follow this convention: when we call it "Fox Bank" or "FoxBank" we are referring to the old, pre-development plantation. 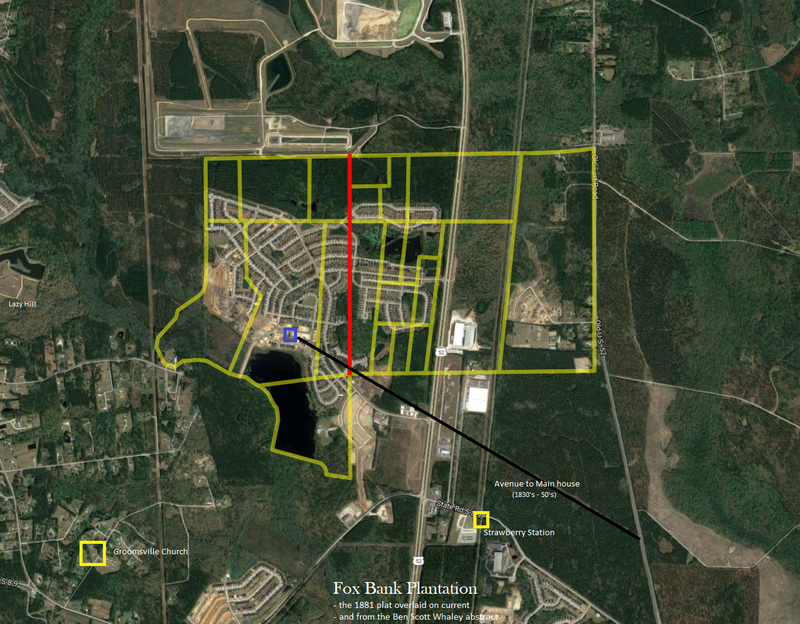 When referring to the modern housing development, we use the name "Foxbank." All of Fox Bank in 1881. Earlier, the lower wedge on the right all the way to Cypress Gardens Road was Fox Bank. 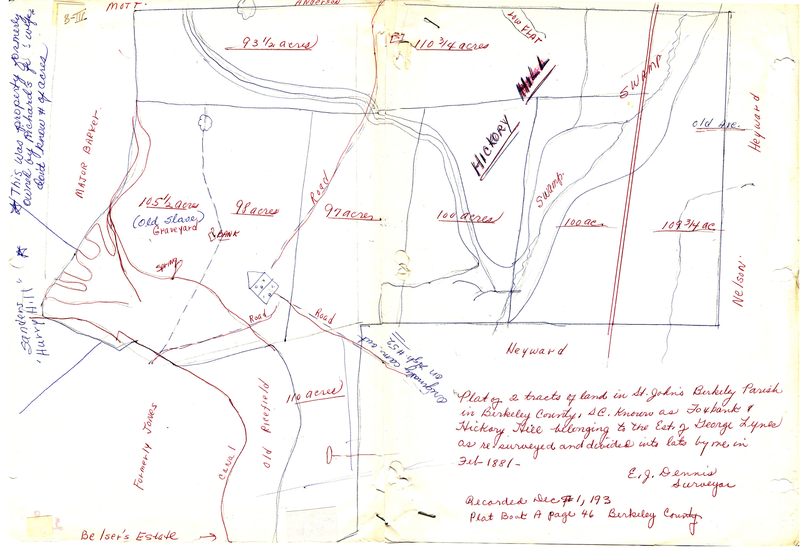 The 1881 plat overlaid on current map, lines from the Ben Scott Whaley abstract. The avenue to the Main house was once on Fox Bank property. The gate was on old 52. This plat shows the first divisions, by heir, and then the occupants afterward. 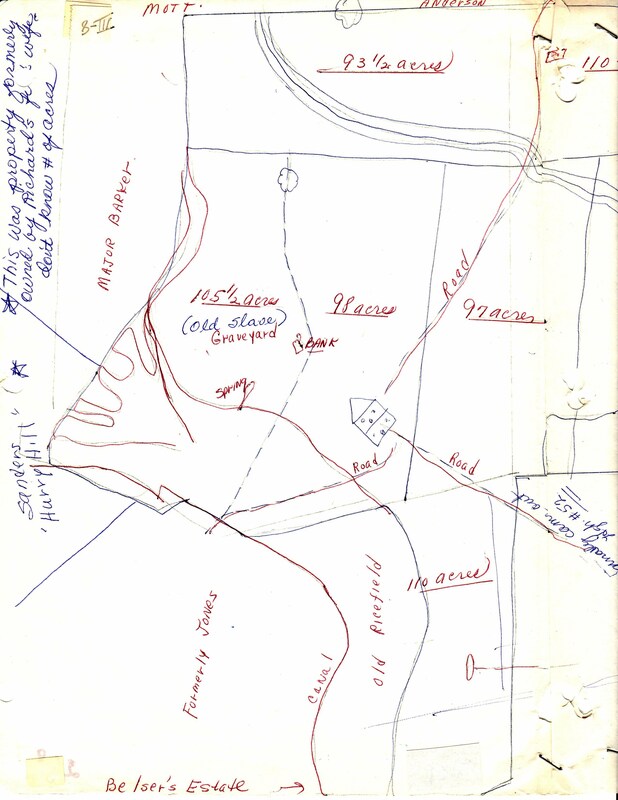 For example, the Samuel Lynes tract (6) was later occupied by Lucas, Campbell, Moter, Fulton, McCrad, Polite, Gaillard. 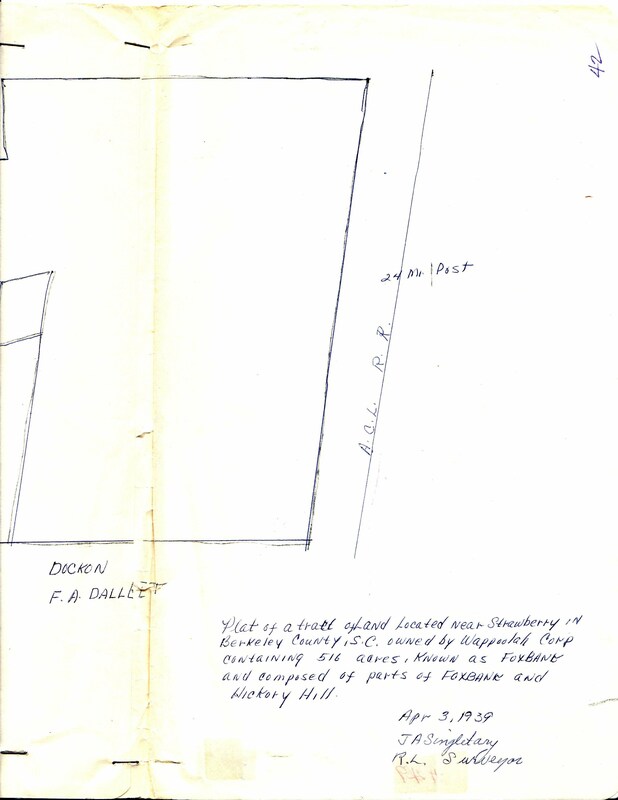 This 1881 plat shows a few details that the previous does not, such as the location of the slave cemetery. 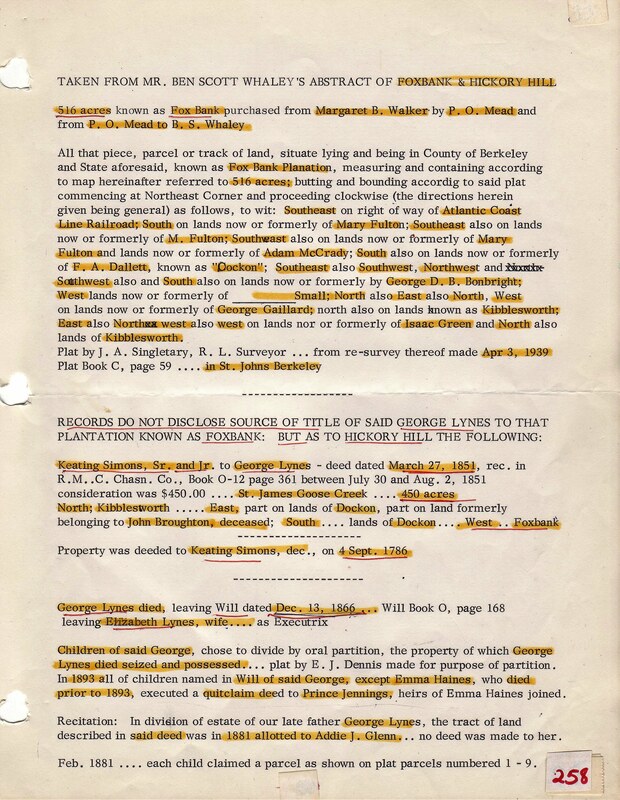 Below are the notes and abstract from the title search Ben Scott Whaley did in his due diligence to purchase Fox Bank. Although the "bottom line" is provided above, inclusion of these documents may prove of some interest. Note: "Kibblesworth" mentioned above was the home of Rev. Samuel Lynes, Jr., brother to George Lynes. Their plantations adjoined one another. 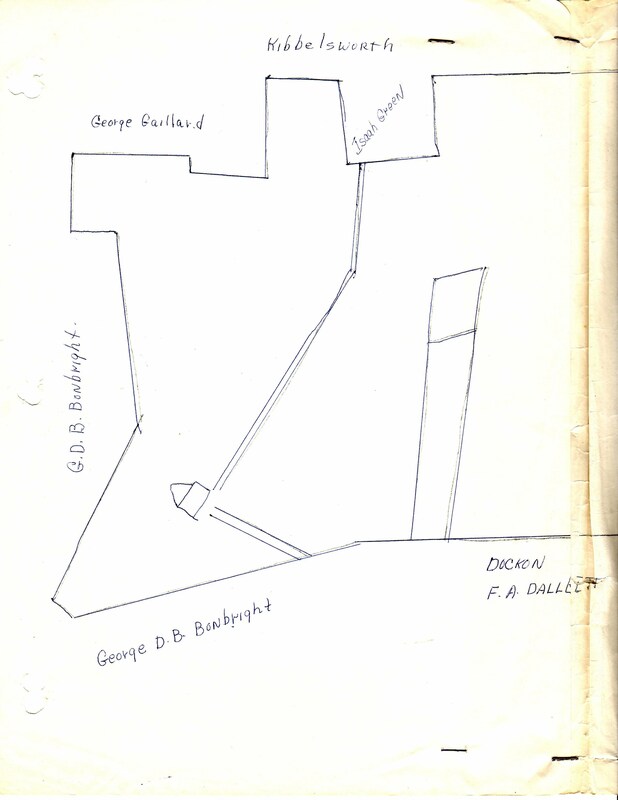 North of Kibblesworth was Oakley Plantation, owned by Guyton, who married one of the daughters of George Lynes.